Rocket Raccoon is done so well, the fact that he's a raccoon isn't even an issue. He fits right into the movie and feels just as real as characters played by live actors. It's as if a talking raccoon is something you see everyday. The same can be said for Groot, a.k.a. the talking tree, who barely says anything more than "I am Groot" throughout the whole film. Rather than being an oddity, he just fits right in, as if seeing such a thing is as common as a talking raccoon. The basic plot revolves around an unlikely group of mercenaries, reluctantly brought together and charged with saving the universe from an out of control villain, Ronan the Accuser. Whilst that is about as straight forward a plot as you can get it's the most fun you'll have seeing how it all unfolds. Guardians of the Galaxy is one of those movies where it's almost the perfect storm between studio, writer/director, cast and crew where everyone knows that embracing some really silly ideas and out there concepts can add up to a whole lot of whimsical fun. Chris Pratt as Peter Quill, a.k.a. Star Lord, does a great job of guiding us into this weird and wonderful world, bringing along a fabulous mix tape of tunes from the 70's and 80's that help make everything seem a little less distant. 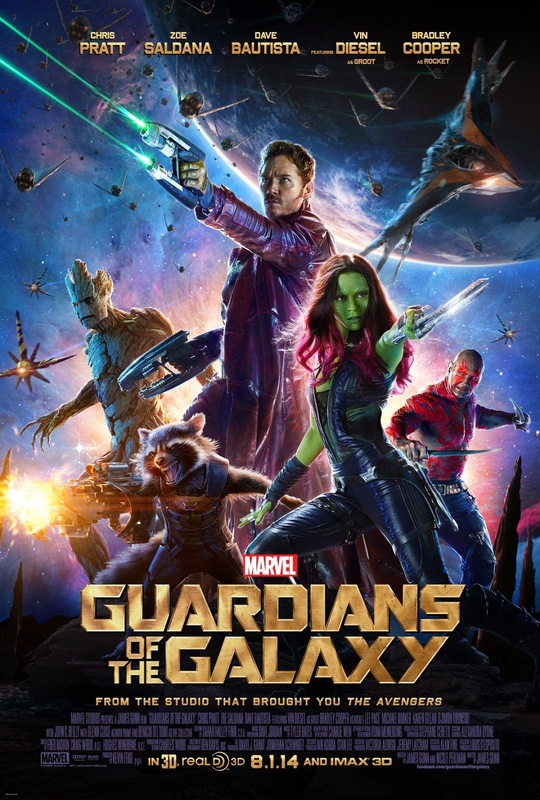 Gamora and Drax played by Zoe Saldana and Dave Bautista are not left out, and are not over shadowed by Rocket (voiced by Bradley Cooper) and Groot (voiced by Vin Diesel). Each of the five heroes get their fair share of screen time, back story and funny lines but not in a way that feels forced. I was expecting to come out of the movie with Rocket as my new favorite character in the Marvel Cinematic Universe but instead I came out a fan of the entire team. As far as action and effects go, it's a Marvel movie. They've got those things down to such a fine art that you'd be more surprised if they weren't good. What's really outstanding is how colorful everything is whilst still managing to be dark and gritty when appropriate. There's only one point in the entire film that's been really divisive for most people because it occurs at a critical moment and seems a flat out silly idea played just for a laugh. You'll know it when it comes along. Personally I was in two minds over it because it was just flat out silly but, at the same time, it's so totally my kind of humor. You probably couldn't get away with it in any other current Marvel movie series but you can in Guardians. For me Guardians of the Galaxy is Marvel's Star Wars Episode IV. It's not the beginning of the story but it's a great entry point into the Marvel Universe. It tells a complete story but there's much more to learn if you want to branch out into a bigger story. Or, if you don't, it's a great piece of Sci-fi entertainment all by its self.